Travelers flying between the Boston area and Tel Aviv will soon have a nonstop option. Beginning in June, El Al Israel Airlines (www.elal.com) plans to start operating three nonstop flights per week using Boeing 767-300ER aircraft, which seat 218. Flight 015 will leave Ben-Gurion International Airport in Israel on Tuesdays, Thursdays and Sundays at 12:30 A.M., arriving at Logan International Airport in Boston, Massachusetts, at 5:45 A.M.; Flight 016 departs Boston on the same days at 9 P.M., arriving in Tel Aviv the following days at 3:05 A.M.
Because of its codeshare partnership with JetBlue, El Al passengers debarking in Boston can easily transfer to flights leaving Logan aboard JetBlue planes. Massachusetts and Israel each play home to startups as well as established leaders in high technology, biotechnology, life sciences and other research fields. Travel between the two high-tech metropolises is already common—and was the main inspiration for El Al President and CEO David Maimon and then-Massachusetts Governor Deval Patrick to push for the new air route. 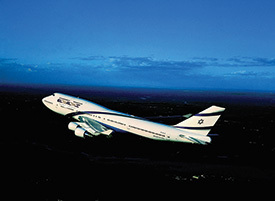 Currently, El Al flies to four North American destinations: John F. Kennedy International Airport in New York, Newark Liberty International Airport in New Jersey, Los Angeles International Airport in California and Toronto Pearson International Airport.